This add-on redirects pages within your existing shopping cart system. To redirect pages during a site transfer or shopping cart platform change, use our 301 URL Redirect. Our Existing Page URL Redirect add-on for your AspDotNetStorefront shopping cart forwards site traffic from deleted or unpublished pages to a new or alternative page, preserving search engine rankings and saving site traffic that would otherwise be lost. This add-on works with any page in your shopping cart including products, categories or manufacturers. Simply select an alternative destination and visitors are instantly redirected to the new page. If you count on search traffic to bring in new business this add-on will be a valuable addition to your AspDotNetStorefront shopping cart system. Retain valuable traffic from high-ranking pages and avoid loosing customers to disabled products or categories. 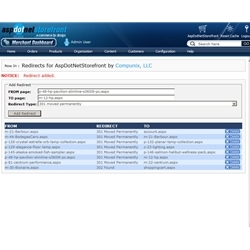 Supports all standard redirects including 300, 301, 302, 303 and 307. - Installation does not requires knowledge of HTML. This product worked exactly as advertised. The support on this was outstanding as I was needing to redirect to a different domain. We had some bugs to work out but communication and support was excellent. A highly recommended product and company! Very nice product and great support from Compunix - I will continue purchasing their add-ons!